The reason our wines often need water during the winemaking process is simple: grapes today, especially in warm climates like California, are left longer on the vine to develop more flavor, more sugar, and more mature (smoother) tannins. But this causes them to lose water naturally, as the mature grapes begin to dry out a bit on the vine. And the high sugar levels can lead to extremely high, even undesirable, alcohol content. Besides getting you drunk quicker--not exactly the goal for most wine lovers--high levels of alcohol can overpower the other flavors in your wine that most of us are looking for. 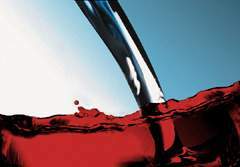 Wine-makers are not exactly eager to share the fact that they add water during the winemaking process. They know that the result is far superior in taste and drinkability, but it still sounds bad, like a bartender watering down the drinks. Most winemakers like to pretend that they are adding water to "unstick" a stuck fermentation. Fermentation "sticks" when the alcohol level in wine becomes so high that it kills the yeast that fuels the fermentation process. (This phenomenon is created artificially in fortified dessert wines, when alcohol is added to a wine with high sugar levels still remaining to stop fermentation and create a sweet wine.) The only way to prevent sticking is to add water, keeping the alcohol percentage low enough to allow the yeast to live and continue fermenting the wine's sugars into more alcohol. But it's more econominal and efficient to just add the water up front, before the fermentation has a chance to become stuck, which is what most winemakers do. Other winemakers in other regions take similar "artificial" actions to improve their wines. In Germany and some other parts of Europe where the weather is cooler, the problem is not too much sugar in the grapes, but too little. For that reason, local wine laws allow the addition of sugar to the must (chaptalization), to give the yeast enough fuel to create the desired alcohol levels. The trick is to use these techniques only when they result in a better quality product, not lower quality. And there's no better way to judge that than by checking out the finished product. If the wine that results is better than a wine produced "naturally"--and really, once you're fermenting something in a charred oak barrel, is there really something more "unnatural" about adding water or sugar?--then perhaps we should be glad that the art of winemaking has been making progress since the Roman days. Read a more detailed article about California winemaking and other techniques for improving the winemaking process. I come from Poland. My country has been under the morbid influence of vodka for so many years, but wine is slowly heading towards no 1. I started adding water to my wine a few years ago mainly because the taste seemed less intense, which I welcomed greatfully. Although there is some type of pressure when I'm in company (most friends either prefer beer or some stronger liquor) I continuously drink wine to my satisfaction. I admit it tastes sometimes as if I were drinking common fruit-juice, when I was a child my mother would always have a pitcher full of some freshly squished fruit juice each and every day. Somehow winewater brings back childhood fantasies. Yes, the ancients always watered down their wine. Mixing 1 Part Wine with 2 Parts water will purify the water. Few are the germs that can handle an alcohol bath. This is carried over in the Roman Catholic Mass; the priest adds water to the wine because that was the standard of the day. For me I have started doing this (1 wine:2 water) and it is good. The flavor is OK, and having the alcohol cut from 15% to 5% makes having a mug of wine much like drinking beer on a hot day. 1/3 cup red wine, 2/3 cup water, add ice... enjoy. Agreed - water and red wine makes this much more "user friendly". People tend to forget that some stronger wines are close to the alcohol percentage of sherry or other fortified wines - and with most wines today served in large 250ml glasses, you'll be putting away units very quickly indeed. Add some water - and on a warm day ice (and yes it works in reds as well) - and you can still enjoy the taste but without waking up with a huge headache.